We love the outdoors and know that you do too! 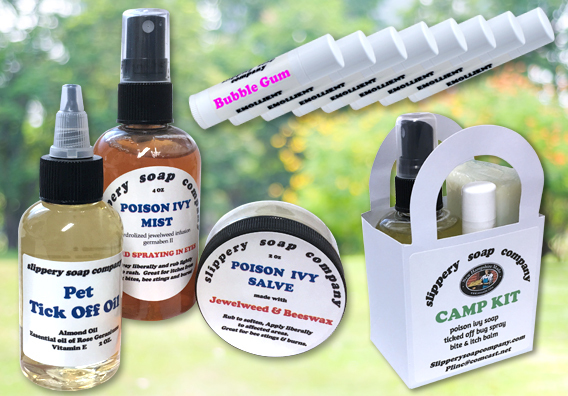 Stay away from those awful, highly-suspect, commercial chemicals and outfit the campsite, house and boat with genuine Slippery Soap all-natural products. Formulated by outdoorsey folk, for outdoorsey folk! Keep the mosquitoes and ticks off the whole family - even your beloved kitty and pooch. Soothe that terrible poison ivy with our fantastic spray, salve or soap. 13 essential oils in an organic Aloe Vera & with hazel base. Ward off tics, black flies and mosquitoes. At the beach you can avoid, sand fleas, gnats, no-see-ums, and chiggers! A simple misting of all exposed skin will protect you for 4-6 hours. STOP THE ITCH AND CLEAR THE RASH! Jewelweed - The natural antidote to poisonous plants like Poison Ivy, Poison Oak, Sumac & Stinging Nettles. Once the rash appears, apply to the affected area. Also works on itchy bug bites, bee stings, and the sting from a burn. Soothe that itchy bug bite. Conveniently packaged in a balm style tube for application. Our Camping Essentials Kit is ideal for any outing and makes a great gift! 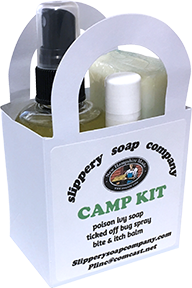 The Camp Kit includes Poison Ivy Soap, Tick Off bug spray and our soothing Bite & Itch Balm. Enjoy our soothing blend of exotic butters, oils and natural bees wax, available in 9 tasty flavors and, of course, New Hampshire Made for purity and effectiveness. You'll love 'em and they make great little gifts and stocking stuffers.